HCC has been held annually in China and overseas countries, while it is the first year landing in Egypt. 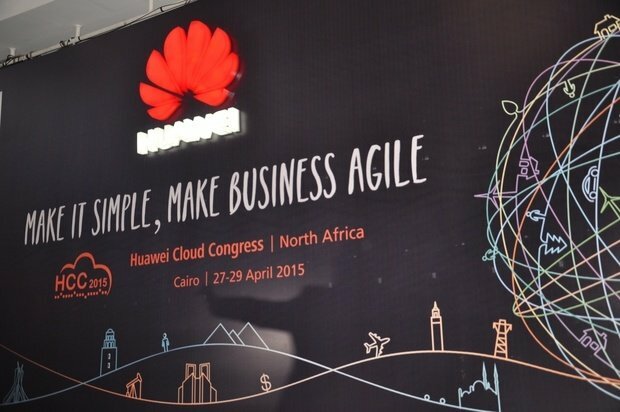 Huawei underscored its ambition to maximize value for customers by simplifying IT systems and making businesses agile with more open, converged, and innovative technologies, at the Huawei Cloud Congress Cairo(HCC Cairo) that took place in April 2015. At the event, Huawei launched converged storage and showcased a series of innovative IT solutions – including data centers, converged storage, cloud operating systems (OS) and Big Data analytics platforms – that bring to life Huawei’s vision to "Make IT Simple, Make Business Agile." The first day of HCC Cairo event has gathered over 280 customers, partners and industry professionals around the northern Africa to share insights and promote dialogue on industry trends and topics around cloud computing and Big Data. Huawei’s partners across the ecosystem, including Inteland SAP joined the meeting and took the keynote speech. "Huawei is committed to be a leading IT company, recognized by enterprises and telecom operators for our innovative, differentiated and industry-leading products and solutions," said Yangtao, the president of Huawei in Egypt. "The products and solutions that Huawei is showcasing at HCC Cairo this year are all based on our commitment to provide customers with open, converged and innovative technologies that enable them to simplify their traditional IT infrastructure, improve business agility and create greater value." Rapid developments in the digital world are redefining information technology. We will see increasing mobility-based data consumption, Internet of Things (IoT)-based data collection, Big Data-based data analytics, and cloud-based data sharing in the near future. Enterprise IT consumption models are also changing: the equipment-centric model is evolving into one that centers on applications and services, and independent data management and operation and maintenance (O&M) will evolve into unified management and operations. Future-proof enterprise data centers will need to be service-driven. One of the flagship solutions unveiled at HCC Cairo is Huawei’s OceanStor V3. Huawei OceanStor is the industry’s first converged storage system and features five key convergence capabilities. First, by converging SAN and NAS, OceanStor reduces investment costs by more than 15% and improves space utilization by 50% over traditional systems. OceanStor also supports the convergence of equipment from multiple vendors, achieving smooth data migration, and enabling customers to boost utilization and protect their existing storage asset. In addition, the system’s converged performance and capacity make it possible to quickly adapt to service needs, switching nimbly between SSD and HDD to achieve the ideal balance between performance and capacity. The convergence of high-end to entry-level storage enables efficient data flow through different data storage levels according to its value to maximize the value of that data, and reduces the cost of utilization by 60%. Lastly, with a converged data lifecycle, where primary storage and backup storage is integrated, customers do not need to purchase dedicated backup software and backup servers, and can achieve data backup within second-level. As part of its commitment to meeting customer needs in the storage domain, Huawei continuously innovates by leveraging its core technologies and expertise. In particular, the development of Huawei's storage products has been guided by the approach of "Intelligence on Demand, Convergence for the Future." Huawei is also unveiling the data center facility such as FusionServer E9000,UPS & IDS, Micro DC,network,data center management solution (ManageOne and eSight),virtualization and cloud solution.Open cloud platform and the OceanStor converged storage system, both of which are key components of the SD-DC² architecture. SD-DC² enables efficient operation and management of both traditional and new services, as well as allows more flexible sharing and allocation of IT resources through service awareness, and ultimately supports customers in making business transformation and innovation more agile. Designed for enterprise and carrier customers, Huawei’s FusionSphere cloud OS helps customers deploy server virtualization, private cloud, public cloud, and hybrid cloud services on demand. Since its launch, Huawei has built more than 120 cloud data centers based on the FusionSphere cloud OS in 42 countries and regions for customers across industries – including public sector, telecom, energy, finance, transportation, healthcare, education, media, and manufacturing – supporting the integration and optimization of existing data centers and service platforms, and enhancing service system reliability and IT operating efficiency.